The Bank of England reported yesterday the latest statistics of one of its flagship measures, the Funding for Lending Scheme. Unsurprisingly, they are disappointing. No, more than that actually: the FLS has been pretty much useless. When launched mid-2012, the FLS was supposed to offer cheap funding to British banks in exchange for increased business and mortgage lending (though originally, authorities strongly emphasised SMEs in their PR as you can imagine) in order to ‘stimulate the economy’. The only effect of the scheme was to boost… mortgage lending. The BoE, unhappy, decided to refocus the scheme on businesses (including SMEs) only, in November last year. Well, as I predicted, it was evidently a great success: in Q114, net lending to businesses was –GBP2.7bn and net lending to SMEs was –GBP700m. 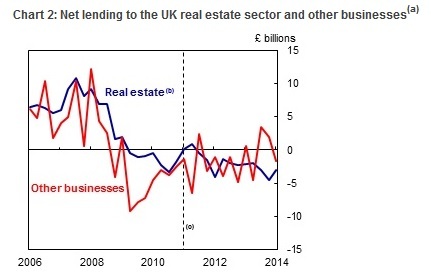 Since the inception of the scheme, business lending has pretty much constantly fallen (see chart below). Figures from the British Bankers’ Association showed net lending to companies fell by £2.3bn in April to £275bn, the biggest monthly decline since last July. The BoE argues that we don’t know what would have happened without the scheme. Perhaps lending would have fallen even more? That’s a poor argument for a scheme that was supposed to boost lending, not merely reduce its fall. Not even all large UK banks participated in the scheme (HSBC and Santander didn’t). Moreover, some banks withdrew only modest amounts because they could already access cheaper financial markets by issuing covered bonds and other secured funding instruments, or, if they couldn’t, used the FLS to pay off existing wholesale funding rather than increase lending… The FLS funding that did end up being used to lend was effective in boosting… the mortgage lending supply. The UK government has also ‘urged’ banks to extend more credit to SMEs. Still, nothing is happening and nobody seems to understand why. For sure, low demand for credit plays a role as businesses rebuild their balance sheet following the pre-crisis binge. Still, nobody seems to understand the role played by current regulatory measures. Central bankers are supposed to understand the banking system. The fact that they seem so oblivious to such concepts is worrying. On the one hand, you have politicians, regulators and central bankers trying to push bankers to lend to SMEs, which often represent relatively high credit risk. On the other hand, the same politicians, regulators and central bankers are asking the banks to… derisk their business model and increase their capitalisation. You can’t be more contradictory. The problem is: regulation reflects the derisking point of view. Basel rules require banks to increase their capital buffer relatively to the riskiness of their loan book; riskiness measures (= risk-weighted assets) which are also derived from criteria defined by Basel (and ‘validated’ by local regulators when banks are on an IRB basis, i.e. use their own internal models). As such, it is unsurprising that mortgage lending never turned negative in the UK (even a single month) throughout the crisis. Even credit card exposures haven’t been cut by banks, as their risk-adjusted returns were more beneficial for their RoE than SMEs’. Furthermore, alternative lenders, who are not subject to those capital requirements, actually see demand for credit by SMEs increase (see also here). RWAs are still in place! Mortgage and household lending will still attract most of lending volume as it is more profitable from a capital point of view. As long as those Basel rules, which have been at the root of most real estate cycles around the world since the 1980s, aren’t changed, SMEs are in for a hard time. And economic growth too in turn. Secular stagnation they said? PS: this topic could easily be linked to my previous one on intragroup funding and regulators “killing banking for nothing”. Speaking of the ‘death of banking’, Izabella Kaminska managed to launch a new series on this very subject without ever saying a word about regulation, which is the single largest driver behind financial innovations and reshaped business models. I sincerely applaud the feat. PPS: The FT reported how far regulators (here the FCA) are willing to go to reshape banking according to their ideal: equity research in the UK is in for a pretty hard time. This is silly. Let investors decide which researchers they wish to remunerate. Oversight of the financial sector is transforming into paternalism, if not outright regulatory threats and uncertainty. PPS: I wish to thank Lars Christensen who mentioned my blog yesterday and had some very nice comments about it. Thanks JN. It is well-deserved! Nice job! Artificially low interest rates play a role as well. They reduce the ROI on loans while the fixed costs of making loans stays the same. The fixed costs on small loans are about as high as those on large loans. If the BOE really wanted to help SMEs they could raise rates a tad. This is true though banks adjust the spreads (= reprice) when interest rates get below a certain threshold in order to cover their fixed costs and not suffer too much from margin compression. As a result, interest rates below a certain level can never be fully transmitted through the lending channel.